"Instant Karma's gonna get you, gonna knock you right on the head!" And that's precisely what happened to Aaron Lewis, the singer from Staind. Hey, Aaron. How do you like your justice served? Scrambled or fried? Now look, seriously... I can't even think about public speaking without my hands shaking and my armpits dumping buckets of sweat. I'd lip sync my entire life if I could. 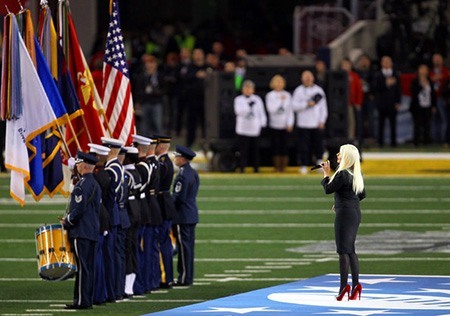 Christina Aguilera graced us with her amazing voice and vocal gymnastics at the NFL's Super Bowl XLV. She didn't use a prerecorded take, she didn't lip sync. She got out there and put her hypothetical nuts on the chopping block. And she he had a tiny goof up. Big deal. She was meant to say "were so gallantly streaming" but said "at the twilight's last gleaming" again. She even caught it and said "twilight's last streaming." Literally nobody there cared. They cheered her on because she was honoring our nation and people. I couldn't do it nor would I even try. "I got so caught up in the moment of the song that I lost my place. I can only hope that everyone could feel my love for this country and that the true spirit of its anthem still came through"
"I guess I just don’t understand how people who sing The National Anthem can be so f-ing self-absorbed that they would try to change that f-ing song. If there is a single song in the history of this country that deserves no creative interpretation, it's that one." He even calls her Cyndi Lauper, as if that's an insult. Fast forward to the MLB's World Series a few years later where homie gets the undeserved chance to sing the National Anthem. And guess what happens? It's just the Star Spangled Banner, bro. How you gonna mess it up, bro? "All I can say is I'm sorry and ask for the Nation's forgiveness. My nerves got the best of me and I am completely torn up about what happened. America is the greatest country in the world. The Star-Spangled Banner means so much to so many, including myself. I hope everyone can understand the intensity of the situation and my true intent of this performance." We forgive you and don't care. Thanks for your performance and for helping us honor the country. Thanks for the chuckle at your own expense!